At Let’s Talk Psychology Practice we are keenly aware of the challenges presented to women and their families during the perinatal period (from pregnancy, to birth, and beyond). We understand that for many individuals the transition to parenthood can be a time of enormous physical, emotional, psychological, and spiritual growth and change. Indeed, each passage through birth into parenthood is a journey into the unknown, with new hopes, fears, expectations, and demands. For many individuals, becoming a parent is the most significant life-changing event they will ever experience. Many adjustments have to be made to successfully navigate the transition to parenthood. This life experience requires complex adjustments and adaptations to the many changes that take place when having a baby. Let’s Talk Psychology Practice provides specialised perinatal psychological services to parents, infants, couples, and families. We aim to provide a service that acknowledges the complex adjustments and adaptations to the many changes that take place when having a baby. She can advise and guide you toward the most appropriate service for your specific needs. Please read below for more information on specialist group based perinatal interventions. Let's Talk Psychology Practice is excited to provide parents with the opportunity to learn about the ways in which babies use body language, sounds, and other signals to communicate their needs using The First Touch Program. The Together With Baby Program is a relationship-based infant massage course that teaches nurturing infant massage techniques to parents. It is run either as a 2-week; 3-week; or 5-week program. 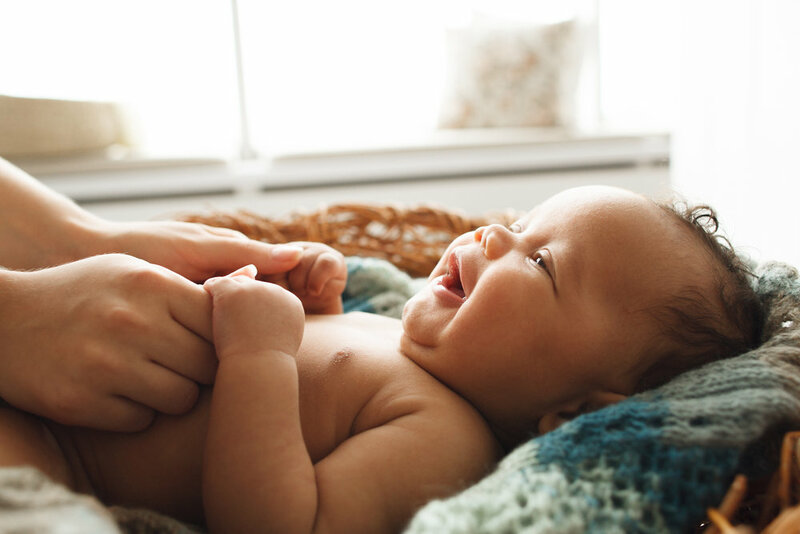 Healthy touch, stroking, and skin to skin contact has been shown to support a baby's emotional, social, and early brain development. Together With Baby also has the potential to reduce infant crying, help improve settling, support a baby's wellbeing and development, help protect and promote a baby's mental health of their mother is recovering from postnatal depression, and help babies bond with their dads. Together With Baby invites parents to pause... to step out of the busyness of life... and to learn how to use touch with their baby to deepen their relationship with, and to support the psychological wellbeing of their baby! Let's Talk Psychology Practice is passionate about, and dedicated to, supporting the psychological wellbeing of parents and their infants. Together With Baby complements the perinatal services provided at Let's Talk Psychology Practice by supporting parents, through a relationship based massage program, to be responsive and attuned to their infants cues of communication. When Is The Next Course Running? The next Together With Baby Program commences on Friday 31st May for 3-consecutive weeks (concluding on Friday 14th June). Classes are limited to a maximum of 5-6 participants/class (places are strictly limited). What's Included? Each session includes morning tea, a relaxation exercise, demonstration and practice of infant massage strokes, and a discussion of a topic related to infant and caregiver wellbeing (e.g. crying and communication, mindful awareness, self care). You are also provided with a bottle of organic baby massage oil and use of all floor cushions, pillows, and blankets needed for your own and your baby's comfort. Cost: The cost of the 3-week program is $350 (rebates may be available through your private health fund). We welcome you and your baby into the Together With Baby Program. Gift vouchers are also available..... imagine being able to give the gift of time and to support the development of a connected, nurturing, and responsive relationship between yourself and your baby or to a new parent and their baby. Contact us today on #0424 143 473 or info@letstalkpsychology.com.au to book a spot or for more information! The transition to motherhood is a time of enormous physical, emotional, psychological, and spiritual growth and change for women, whether or not this is your first child. Realistic preparation for the postnatal period helps to smooth the path for the transition into Motherhood. a Postnatal 1.5hr group session for Mums and their babies (aged 2-13 weeks old). Managing Motherhood helps women prepare for and adjust to the challenges of Motherhood; making the transition into motherhood as smooth and joyful as possible. What Will We Do In The Group? Talk about how to manage new mother moods. learning ways to assist the mother-baby bonding process. I want to Attend – How Do I Enrol? Call Dr Charise Deveneyon: #0424 143 473. ‘Being a Mindful Parent’: Using mindfulness skills to connect with your experience, self, and children in the hear and now.